Grace is poured forth upon thy lips, O holy Father, John Chrysostom! for the Lord hath anointed thee priest of his people, to feed the flock in holiness and justice. Therefore, armed with the sword of strength, thou didst cut short the prattling of heresies: oh! cease not, now, to pray that the world may be in peace, and our souls be saved. May thy heavenly grace, O Lord, we beseech thee, enlarge thy church, which thou wast pleased to enlighten with the glorious virtues and learning of blessed John, thy Confessor and Bishop. Through our Lord Jesus Christ, thy Son, who liveth and reigneth with thee, in the unity of the Holy Ghost, God, world without end. Amen. Before our Emmanuel came upon this our earth, men were as sheep without a shepherd; the flock was scattered, and the human race was hastening on to perdition. Jesus would, therefore, not only be the Lamb that was to be slain for our sins; he made himself, moreover, a Shepherd, that so he might bring us all back to the divine fold. But, as he had to leave us when he ascended into heaven, he has provided for the wants of his sheep, by providing us with a succession of Pastors, who should, in his name, feed the flock, even to the end of the world. Now, instruction, which is the light of life, is what the flock of Christ needs above all other things; and therefore our Emmanuel required that the Pastors of his Church should also be Doctors of sacred science. The Pastor owes two things to his people; namely, the Word of God, and the Sacraments. He is under the obligation of dispensing, personally, and unceasingly, this twofold nourishment to his flock, and of laying down his very life, if needed, in the fulfilment of a duty, on which rests the whole work of the world's salvation. But, since the disciple is not above his Master, the Pastors and Doctors of the christian people, if they are faithful in the discharge of their duties, are sure to be hated by the enemies of God; for they cannot spread the Kingdom of Christ, without, at the same time, taking from the power of Satan. Hence it is, that the history of the Church is filled with the persecutions endured by her Pastors and Doctors, who continued the ministry of zeal and charity begun by Christ upon the earth. These contests have been threefold, and gave occasion to three admirable victories. The Pastors and Doctors of the Church have had to struggle with Paganism, which sought, by inflicting tortures and death, to oppose the preaching of the law of Christ. It was this sort of persecution which gave the Church such Saints as those whom we celebrate during this Season of Christmas—Polycarp, Ignatius, Fabian, Marcellus, Hyginus, and Telesphorus. When the era of Persecution was over, the Pastors and Doctors of the christian people had to engage with enemies of another kind. Kings and Princes became children of the Church, and then sought to make her their own slave. They imagined that it would serve their political interests to interfere with the liberty of the Word of God, which, like the light of the sun, was intended to be carried, without hindrance, throughout the whole earth. They usurped the priestly power, as did the Pagan Cӕsars, and presumed to set limits to the administration of those sources of life, which become corrupt as soon as they are touched by a profane hand. This usurpation gave rise to an incessant contest between the temporal and spiritual powers, and produced a second class of Martyrs. God has glorified his Church during this long period of struggle, and has given her, from time to time, a brave defender of ecclesiastical Liberty. We have met two of these champions of the Word and the holy ministry, during our Christmastide—Thomas of Canterbury, and Hilary of Poitiers. But there is a third sort of battle in which the Pastors and Doctors of the flock of Christ have had to fight—it is the battle with the world and its vices. It began when Christianity began, and will continue to the day of Judgment. It was their courage in this battle, that made so many saintly Prelates be hated for the name of Jesus Christ. Neither their charity, nor their services to mankind, nor their humility, nor their meekness, protected them from ingratitude, spleen, calumny, and persecution. And, what was their offence? They had been faithful in their duty of preaching the doctrines of their Divine Master, of encouraging virtue, and of chiding the sins of men. The amiable Francis of Sales was as much disliked and even hated by bad men, as was John Chrysostom himself, whose triumph gladdens the Church to-day, and who stands near the Crib of his Lord, as one of the most illustrious Martyrs of pastoral duty courageously discharged. Fervent in the service of his Saviour, even to the observance of the divine Counsels, (for he had embraced the monastic life,) this golden-mouthed Preacher made no other use of his wonderful gift of eloquence than that of urging men to the observance of the virtues taught in the Gospel, and of reproving every vice. Satan sought to have his revenge against our Saint, by raising him many enemies. Among these, were an Empress, whose vanities and sins he had rebuked; men in power, whose wickedness he had held up to notice; women of influence, who would have him preach a morality more in accordance with their own depravity; a Bishop of Alexandria, and certain Prelates of the Court, who were jealous of his virtues, and still more so of his reputation. He is exceedingly loved by his people—but, neither that nor his great virtues protect him from persecution. He whose eloquence had enraptured the people of Antioch, and won for him the enthusiastic admiration of the citizens of Constantinople, was deposed in a council convened for the purpose, his name was ordered to be cancelled from the diptychs of the Altar, notwithstanding the energetic protest of the Roman Pontiff; and, at length, he was condemned to exile, and died on the way, worn out by the hardships and fatigues he had to go through. But, this Pastor, this Doctor, was not vanquished. He said, in the midst of all his persecutions, Wo is unto me if I preach not the Gospel! (I Cor, ix. 16) He made use, too, of those other words of the great Apostle: The word of God is not bound (II Tim, ii. 9). The Church triumphed in him; she was more glorified and more consoled by the unflinching courage of Chrysostom, who was led into captivity for having preached the Gospel of Christ, than she had been by the success achieved by his eloquence, an eloquence which Libanius was heard to covet for his pagan Orators. Let us hearken to the thrilling words of Chrysostom, which he addressed to the Faithful immediately before his last banishment. He had been sent into exile once before; but a terrific earthquake happening immediately after his departure, and which was looked upon as sent by heaven to punish the authors of so crying an injustice—the Empress herself went, with tears in her eyes, to ask the Emperor to recall him. Accordingly, he was permitted to return. Shortly after, fresh occasions were sought for, and John is again sentenced to exile. He receives the intimation with all the calmness of a Saint, who knows that the whole Church is on his side. Let us study this glorious model of a Bishop trained in the school of our Jesus, who is, as the Apostle calls him, the Shepherd and Bishop of our souls (I St. Peter, ii. 25). “Many are the waves, and threatening are the storms, which surround me; but I fear them not for I am standing on the Rock. Let the sea roar; it cannot wash away the Rock: Let the billows mount as they will; they cannot sink the bark of our Lord Jesus Christ. And tell me, what would you have me fear? Death? To me, to live is Christ; and to die, is gain (Phil, i. 21). Exile? The earth is the Lord's, and the fulness thereof (Ps, xxiii. 1). Confiscation of my goods? We brought nothing into this world; and, certainly, we can carry nothing out (I Tim, vi. 7). No—the evils of this world are contemptible, and its goods deserve but to be laughed at. I fear not poverty, I desire not riches; I neither fear to die, nor wish to live, save for your advantage sake. Your interest alone induces me to speak of these things, and to ask of you, by the love you bear me, to take courage. “For, no one can separate us; no human power can part what God has united. It is said of husband and wife: Wherefore, a man shall leave father and mother, and shall cleave to his wife; and they shall be two in one flesh (Gen, ii. 24): Therefore, what God hath joined together, let no man put asunder (St. Matth, xix. 6). Thou canst not, O man, dissolve the nuptial tie—how hopest thou to divide the Church of God? It is she whom thou attackest, because thou canst not reach him whom thou fain wouldst strike. Thou makest me more glorious, and thou but wastest thy strength in warring against me, for it is hard for thee to kick against the sharp goad (Acts, ix. 6). Thou canst not blunt its point, and thou makest thine own foot bleed, just as the billows, when they dash against the rock, fall back mere empty froth. “Believe me, O man, there is no power like the power of the Church. Cease thy battling, lest thou lose thy strength; wage not war with heaven. When it is with man thou warrest, thou mayest win, or lose; but when thy fighting is against the Church, it is impossible thou shouldst conquer, for God is above all in strength. Do we provoke the Lord to jealousy? Are we stronger than he? (I Cor, x. 22) God founded, God gave firmness: who shall be so bold as to attempt to pull down? Knowest thou not his power? He looketh upon the earth, and maketh it tremble (Ps, ciii. 32); he gives his order, and that which trembled is made firm again. If he made firm the City after an earthquake had shaken it, how much more could he not give firmness to the Church? The Church is stronger than heaven itself: Heaven and earth shall pass, but my words shall not pass (St. Matth, xxiv. 35). What words? Thou art Peter; and upon this Rock will I build my Church, and the gates of hell shall not prevail against it (St. Matth, xvi. 18). “If thou wilt not believe his word, believe facts. How many tyrants have sought to crush the Church? They had their gridirons, and fiery furnaces, and wild beasts, and swords—and all failed. Where are those enemies now? Buried and forgotten. And the Church? Brighter than the sun. All they had is now past; but her riches are immortal. If the Christians conquered, when they were but few in number; canst thou hope to vanquish them, now that the whole earth is filled with the holy religion? Heaven and earth shall pass, but my words shall not pass. Wonder not at it; for the Church is dearer unto God, than the very heavens. He took flesh not from heaven, but from his Church on earth; and heaven is for the Church, not the Church for heaven. “Be not troubled at what has happened. I ask this favour of you—be firm in your faith. Have you not observed, that, when Peter was walking on the waters, and began to fear, he was in danger of sinking, not because the sea was rough, but because his faith was weak? Have I been raised to this dignity by human intrigue? Was it man that brought me to it, or can man now depose me? I say not this from arrogance or boasting; God forbid! I say it from the desire of calming your trouble. “The devil no sooner saw that your City was tranquillised, than he plotted how he might disturb the Church. Thou wicked and most impious spirit! thou couldst not throw down the walls of a City; and thinkest thou thou canst make the Church fall? Does the Church consist of walls? The Church consists of the multitude of the Faithful. Look at her pillars, and see how solid they are, fastened, not by iron, but by faith. Not only is the great multitude itself more vehement than fire, but even one single Christian would conquer thee. Hast thou forgotten the wounds thou receivedst from the Martyrs? Oftentimes the combatant was a tender maiden; delicate as a flower, yet firmer than a rock. Thou didst mangle her flesh, but her faith was proof against all thy tortures. Her blood fell as nature felt the wounds, but her faith fell not; her body was torn, but her manly soul flinched not; what was material was spoilt, what was spiritual was untouched. Thou couldst not vanquish one woman; and yet thou hopest to vanquish a whole people? Hast thou not heard these words of the Lord: Where there are two or three gathered together in my name, there am I in the midst of them? (St. Matth, xviii. 20) And thinkest thou, he will not be in the midst of a numerous people, united together by the ties of charity? What humility and courage in this saintly minister of Christ! What a consolation for the Church when God sends her men like this! He has given four to the Eastern Church: Athanasius, Gregory of Nazianzum, Basil, and Chrysostom. In spite of the immense dangers to which faith was exposed during the age in which they lived, these four Holy Doctors, by their sanctity, learning, and courage, kept it alive among the people. Athanasius and Gregory appear to us in that period of the Ecclesiastical Year, when the Church is radiant with her Easter joy, and celebrates the Resurrection of her Divine Spouse. Basil's feast gladdens us in the season of Pentecost, when the Church is filled with the gifts of the Holy Ghost. Chrysostom comes at Christmastide, and adds to the joy of the dear Mystery of Bethlehem. 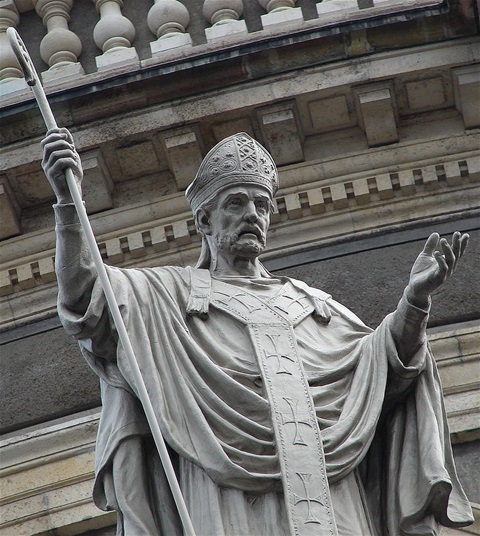 Let us, the favoured children of the Latin Church, which alone has preserved the primitive faith, because Peter is with her—let us honour these four faithful guardians of Tradition: let us, to-day, pay the homage of our devotion to Chrysostom, the Doctor of the universal Church, the conqueror of the world, the dauntless Pastor, the successor of the Martyrs, the Preacher by excellence, the admirer of St. Paul, and the fervent imitator of our Lord Jesus Christ. The Roman Church, in the Lessons of to-day's Office, thus speaks the praises of our Saint. John, surnamed Chrysostom on account of his golden eloquence, was born at Antioch. Having gone through the study of the law and the profane sciences, he applied himself, with extraordinary application and success, to the study of the Sacred Scriptures. Having been admitted to holy orders, and made a Priest of the Church at Antioch, he was appointed Bishop of Constantinople, after the death of Nectarius, by the express wish of the Emperor Arcadius. No sooner had he entered upon the pastoral charge, than he began to inveigh against the licentious lives led by the rich. This his courageous preaching procured him many enemies. He likewise gave great offence to the Empress Eudoxia, because he had reproved her for having appropriated to herself the money belonging to a widow, name, Callitropa, and for having taken possession of some land which was the property of another widow. At the instigation, therefore, of Eudoxia, several Bishops met together at Chalcedon. Chrysostom was cited to appear, which he refused to do, because it was not a Council either lawfully or publicly convened. Whereupon, he was sent into exile. He had not been gone long, before the people rose in sedition on account of the Saint's banishment, and he was recalled, to the immense joy of the whole city. But, his continuing to inveigh against the scandals which existed, and his forbidding the games held before the silver statue of Eudoxia, which was set up in the space opposite Sancta Sophia, were urged by certain Bishops, enemies of the Saint, as motives for a second banishment. The widows and the poor of the City bewailed his departure as that of a father. It is incredible how much Chrysostom had to suffer in this exile, and how many he converted to the Christian Faith. At the very time that Pope Innocent the First, in a Council held at Rome, was issuing a decree, ordering that Chrysostom should be set at liberty—he was being treated by the soldiers, who were taking him into exile, with unheard of harshness and cruelty. Whilst passing through Armenia, the holy Martyr Basiliscus, in whose Church he had offered up a prayer, thus spoke to him during the night: “Brother John! we shall be united together to-morrow.” Whereupon, on the following morning, Chrysostom received the sacrament of the Eucharist, and, signing himself with the sign of the cross, he breathed forth his soul to his God, on the eighteenth of the Calends of October (September 14th). A fearful hail-storm happened at Constantinople after the Saint's death, and, four days after, the Empress died. Theodosius, the Son of Arcadius, had the Saint's body brought to Constantinople, with all due honour, where, amidst a large concourse of people, it was buried on the sixth of the Calends of February (January 27th). Arcadius, whilst devoutly venerating the Saint's relics, interceded for his parents, that they might be forgiven. The body was, at a later period, translated to Rome, and placed in the Vatican Basilica. All men agree in admiring the unction and eloquence of his sermons, which are very numerous, as indeed of all his other writings. He is also admirable in his interpretation of the Sacred Scriptures, which he explains in their genuine sense. It has always been thought that he was aided, in his writings and sermons, by St. Paul the Apostle, to whom he entertained an extraordinary devotion. St. John Chrysostom, pray for us.